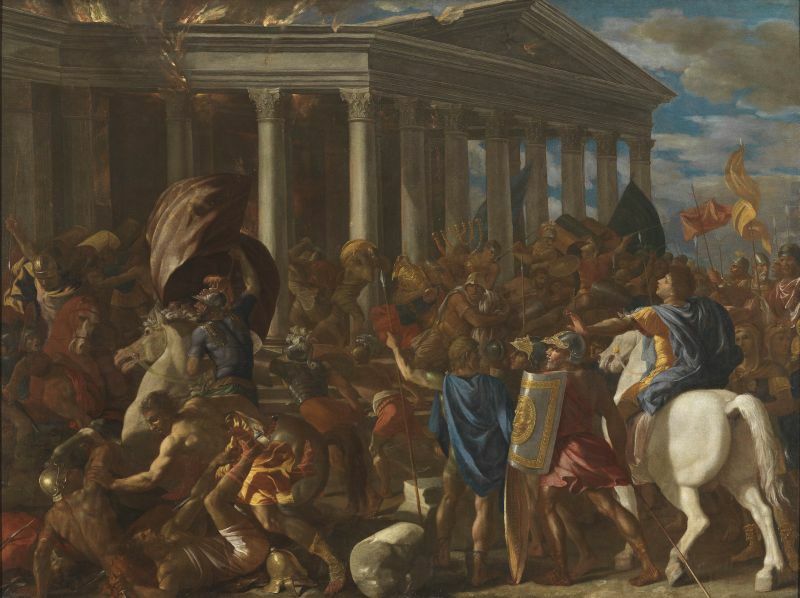 This work from Poussin’s early Italian period was commissioned by his patron Cardinal Francesco Barberini and offered as a gift to Cardinal Richelieu, the French head of state. At the time, Barberini was head of a papal legation that attempted in vain to negotiate an end to the bloody war between France and Spain. Poussin draws a parallel between his patron, the would-be peacemaker, and the enlightened pagan emperor Titus, who - according to the account of Josephus Flavius - tried unsuccessfully to prevent the ruin of Jerusalem and its Temple.|Classical Roman architecture and sculpture provided Poussin with visual inspiration: the facade of the Pantheon; the equestrian statue of Marcus Aurelius in the Capitoline; and the famous depiction of the menorah on the Arch of Titus. The composition is divided between the Temple in the background and the chaotic struggle, dominated by the striking figure of Titus on his white mount, in the foreground. |After Richelieu’s death, this painting changed hands many times and eventually reached England. Its whereabouts were unknown from the late 1700s until 1995, when it was rediscovered, restored, and gifted to the Israel Museum in 1998.